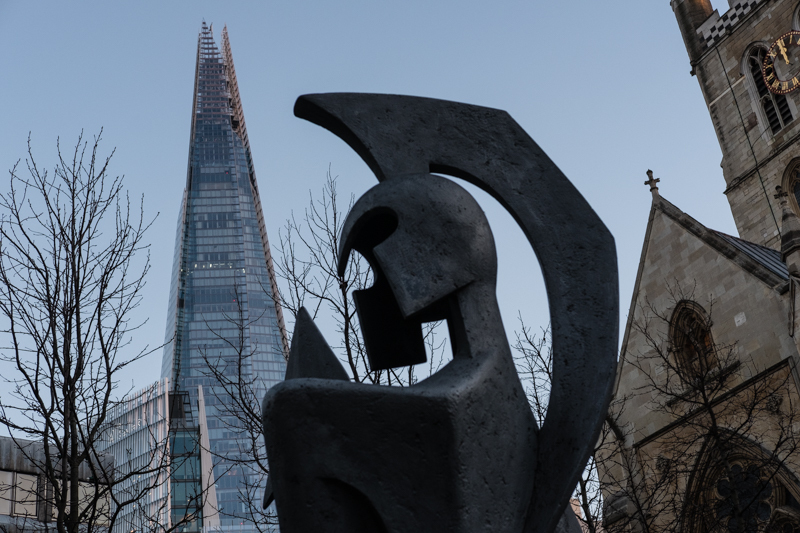 A Roman Warrior, an historic church, and a modern glass tower, only in London would all this sit side by side. The site occupied by Southwark Cathedral has always been a place of worship, prior to the earliest Christian church in the seventh century, there is evidence to show Roman pagan worship took place here. Now there is a monument in honour of the religion of money, the towering Shard with its exclusive hotel and expensive viewing platform has taken over from the Bishops who managed the brothels along the waterfront in the middle ages. My dad used say that everything is always changing but deep down not much really changes. The sculpture is quite modern, but it really does evoke the Roman era. What is becoming of our beloved London?